Then a visitor called AK posted the following comment, which is very worth reading. To follow on from your comment Robin: in the eighties, the Muslim Brothers were threatening the peace of Latakia. One day, Alawii groups were walking toward Sunni streets aiming for revenge. They faced a group of Alawii Sheikhs that were protecting the Sunnis. This stopped the potential civil unrest in Latakia in its infancy; nothing happened afterward. This is a well known fact, you can ask about it..
Robin, Al Assad family are not able to understand that anybody else except them could represent Alawii. The original deal was that Hafez is the political leader, Rafaat was the Army leader and Jamil was the spiritual leader. There was no economical leader. For this position they appointed Al Makhlouf family. I feel sick of writing and talking about this, It is obvious to me so much that I don’t know where to start from and why educated people such as Joshua are struggling to understand. I advise anybody that struggles to understand how Syria is ruled to watch “The God Father”. Syria is not sectarian. It has been made sectarian so some people keep their chairs. Al Shabi7a are originally the group of drug and money smugglers that worked with Al Assad family in Latakia. Mouhammed Al Assad (Sheik Al jabal) is one of their leaders, Fawaz Al Assad is another one. To be an Alawii is not a must to become a Shabeh, you just need to be loyal to the cause (smuggling) and the master. Iyad and Ihab Makhoulf used many Sunnis, Alawiis and Christians Shabi7a in the nineties to smuggle Damascene business men money to Lebanon and to steal Lebanese cars. Their network was discovered only when they stole Al Hrawai son’s car. Nowadays some of these Shabi7a thugs are coming from Al Skentouri and Al Slaybeh in Latakia. These are Sunni pockets. However, I believe that al Shabeha are the natural development of 40 years of the same ruling regime, the same as Salafis. Both of these groups are two faces of the same coin. They both came because of the regime! The regime protects the minorities as long as they protect and defend it. 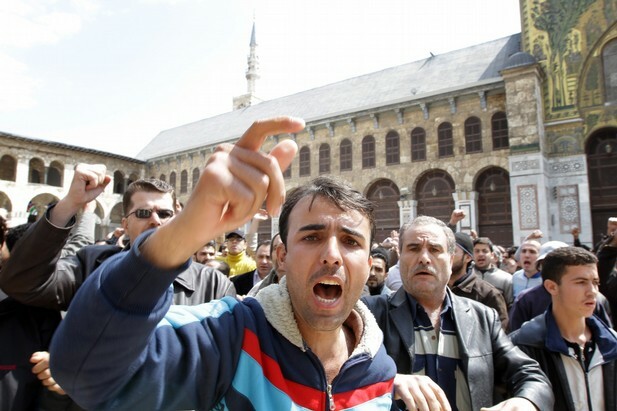 The regime will use minorities to destabilize Syria long before they give up power. I feel that our duty as intellectuals is to keep talking about national unity, to keep talking about the Syrian population as a whole. We must avoid talking about sectarianism even if we see it happening in front of our eyes. The regime is not an Alwaii regime, nobody can convince me of that. Bashar is married to Al Akhras family, this family was prohibited from entering Syria before the marriage. This family agreed to be part of the ruling group, and so many other people did. Bashar didn’t marry an Alawii because he wanted to give a message to the Sunni population, not because he was in love with Asmaa Al Akhras! Loss aversion is very prominent these days. People are worried and afraid of change. For this change to happen, I think that the opposition leaders should assure minorities, they should make their agenda and themselves clear and publicly known. So many Alawiis hate the regime but they are worried that the majority will take revenge. Assure Alawiis and other minorities and you will see the difference. Did Iraqis not also live together in peace before occupation? When you talk about Syria historically, you need to include Lebanon too. Is it in the nature of the Lebanese and Iraqis to be sectarian and fight among each other? Of course not. Fact is all it takes is a few people to make things bad for everyone. Just look at Egypt’s recent events. You have to understand that just like in Lebanon, many countries have a vested interest in making Syria into a sectarian zone where they kill each other to weaken themselves. Today, there is proof that direct Saudi and UAE funding was used to sponsor Wahhabi operations targeting civilians in Pakistan. I don’t think I have to explain to you that they have been funding similar groups in Iraq and Lebanon as well. They will do the same in Syria. Syrians aren’t sectarian by nature, but when attacks become targeted against certain groups it is bound to create sectarian emotions and feelings, just like the terrorist Muslim Brotherhood did in the late 70s and 80s. If these terrorist groups today are left to their own ways, the Syrian people won’t be immune. All it takes is a few thousand people and that’s very easy to do, not to mention foreigners coming in, which is what we are already seeing today. Murad – see the comments after the previous post, where I wrote: “Comparisons with Lebanon and Iraq are valid but should not be overemphasised. Shia were systematically discriminated against in Saddam’s Iraq in a way that Sunnis weren’t in Syria. Saddam was able to characterise the 91 uprising as Shia because the uprising – unlike Syria’s – was geograaphically limited. The people in the south saw Iraqi soldiers returning from Kuwait barefoot and semi-naked. People further north didn’t. Then the American dismantlement of the state opened the way for gangs and militias. This could happen in Syria if the regime decides that the entire state machinery must fall with it. Next, the final catalyst for civil war in Iraq was the contradictory responses of Sunni and Shia to foreign occupation. There isn’t going to be a foreign occupation in Syria. Elie Elhadj sends in this interesting essay on relations between Syria’s Christians, the regime and the Sunni majority. Those among Syria’s Christian clerics and civic leaders who publicly support the Asad regime are short sighted. They are courting long-term disaster for themselves and their congregations. Why? Because, the Asad regime will not remain in power forever; it is immoral to support non-representative unjust rule; the Asad clan’s exploitation of Sunni Islam has emboldened Islamism and thwarted the development of secularism in Syria; and because scaremongering for blackmail legitimacy will not work forever. The following explains each reason. More mosques, bigger congregations, and more veiled women than ever before have become the order of the day in Syrian cities. To flaunt his Islamic credentials, President Bashar Asad even ordered a special rain prayer throughout Syria’s mosques performed on December 10, 2010 in order for God to send rain. Islam is helpful to Muslim rulers. Not only in Syria, other Arab regimes (except Lebanon and Tunisia) exploit Islam to stay in power. [xii] Islam demands obedience of Muslims to the Muslim ruler. The Quran, the Prophetic Sunna, and opinions of famous jurists enjoin Muslims to obey the Muslim ruler blindly. In 4:59, the Quran orders: “Obey God and obey God’s messenger and obey those of authority among you.” Answering how a Muslim should react to a ruler who does not follow the true guidance, the Prophet reportedly said, according to Sahih Muslim: “He who obeys me obeys God; he who disobeys me, disobeys God. He who obeys the ruler, obeys me; he who disobeys the ruler, disobeys me.”[xiii] Abi Da’ud (d. 888) and Ibn Maja (d. 886) quote the Prophet as imploring Muslims to hear and obey the ruler, even if he were an Ethiopian slave. [xiv] Al-Bukhari (d. 870) quotes similar traditions. [xv] The palace ulama invoke one thousand year old opinions of famous jurists such as Al-Ghazali (1058-1111), Ibn Jama’a (1241-1333), and Ibn Taymiyya (1263-1328). These men taught that the Muslim ruler must be obeyed blindly because even an unjust ruler is better than societal unrest. That the options to Syrians today are reduced to either accepting the current poor state of affairs or contend with an Islamist/salafi rule; even civil war, is blackmail used by the regime to perpetuate its monopoly on power and avoid genuine reform. That genuine reform is not an option does not bode well for the country. That President Asad insisted in his address to the parliament on March 30, 2011 that Syria’s protesters had been “duped” into damaging the nation on behalf of its enemies[xvi], and his infamous billionaire cousin, Rami Makhlouf, stated in an interview with The New York Times that, “Syria will fight protests till ‘the end’” spell danger to all Syrians. [xvii] Like a pressure cooker, the longer a dictatorship stays in power the more violent the end will be. Bashar Asad has a rare opportunity today to become the hero who saved Syria from a frightening future. Would he? Or, indeed, can he? [iv] Thomas Friedman, From Beirut to Jerusalem, (Harpers Collins Publishers, 1998, London) Chapter 4: “Hama Rules”. [vi] Patrick Seale, Asad, the Struggle for the Middle East (Berkeley, California: University of California Press, 1995), 10. [xiii] The Six Books Sahih Muslim, traditions 4746 to 4763, pp. 1007-1008 and traditions 4782 to 4793, pp. 1009-1010. [xiv] Ibid., Sunan Abi Da’ud, tradition 4607, p. 1561; and Sunan Ibn Maja, tradition 42, p. 2479. [xv] Ibid., Sahih al-Bukhari, traditions 7137 and 7142, p. 595. Very graceful of you to publish Elie’s carefully researched academic essay in support of Joshua’s and Camille’s argument! I have no idea what you mean, Naji. Elie’s essay has a couple of generalisations I don’t agree with, but it certainly doesn’t support Joshua’s argument. (Camille doesn’t make an argument; he merely slanders the protestors). Elie shows that Syria’s sunnis are not necessarily sectarian extremists, that the Asad regime is guilty of exploiting sectarianism, that dictatorship breeds extremism, and that it is inadvisable to support the regime. Good luck with the Antalya Conference next week. Robin, did you read this????? And for shedding some light on the biased strange vibes coming from Syria Comment completely slandering protesters and giving a regime-tv like image of Syria, I really don’t think we need an American who can’t see anything else than sects in Syria to tell us what is going on today in nation wide demonstrations of pro-democracy movement among other such movements all over arab countries. The real danger of sectarianism gets bigger every day this regime stays in power, as soon as possible, our best chance is a democratic change, which this regime will never initiate by them selves. that is up to the people.